I am exhausted. This project is becoming super draining. I’m lucky that I now have some people helping out with a number of the assets, but it’s still very taxing. While I didn’t manage to complete the first level as I had hoped, I did manage to get the base environment for it sorted out. I’ve got a texture artist doing materials and a 3D modeler helping out with the, well, models! Hopefully together we can smash through a good number of the base levels and assets before the end of September. Also need to make sure I find the balance between pushing myself and self-care. Along-side way too many social obligations, this month is going to be intense. Just need to get as much as I can done. Hey! Sorry I’m a few days late on this one. This month has been a bit of a roller-coaster. 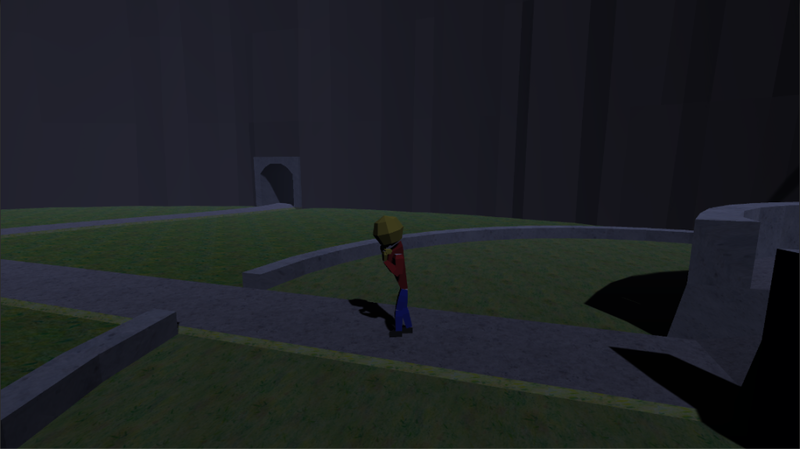 I’ve managed to complete a number of things, and I’ve finally started working on the player and animations. It’s just a rough little model for now before I start bringing in the real stars of the show, but it’s a good place-holder to tie up some of the final little details. I’ve also been talking to some people to help me out with some of the assets I can’t work-on myself. I still hope to have a rough of the first level finished by the end of the month, as well as a number of other things, so I’m just going to cram in as much work as I can! 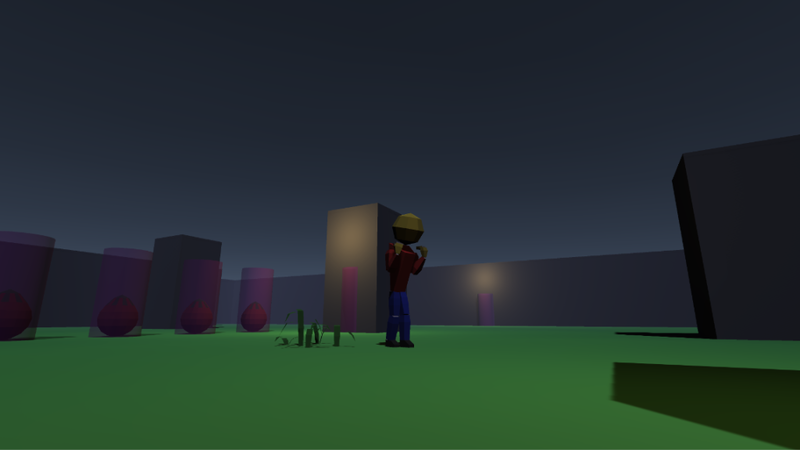 As a little bonus for being late, I’ll drop in a screenshot of the rough character standing around the developer level. Hey all! Sorry I’m a day late again; time and tech and work. Offt, this has been a stressful fortnight! I’ve been grinding hard to get this engine as completed as possible to regain lost-time. While not entirely caught-up, I have fortunately managed to get a LOT done! There’s still more to do, but I’m entering a stage where I can start working on art assets so I can start building the game world properly! Unfortunately, no images this post as a lot of my time has been coding based. However! A brief run-down on things I’ve managed get running! Menus now work; from pause menus, to the main menu, to a pre-game loading screen. Still need to be filled up with content, but the functions are all there and all automated! With loading comes scene management, including level transitioning, level properties, and game resetting. Very important! Items are functional (albeit non-existent), and various overlays work, including the HUD, and more! An important lesson I learned from working on the (currently shelved) Monochrome Engine was automate and prefab everything! 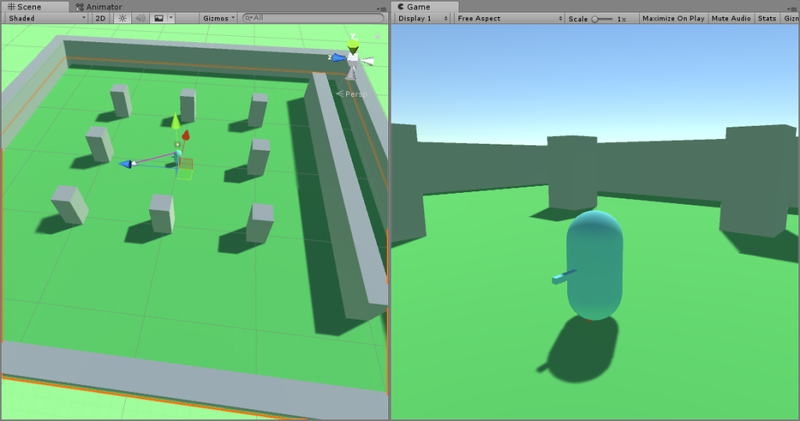 This has become even more crucial working with Unity as it is such an object-oriented engine whereas M.E. was more self-managed by a single, way-too-big script controlling various classes. Working with a professional game engine that manages a lot of the difficult things (such as physics and lighting) just helps so much. Of course, even though I’m improving and the project is getting done, I’ve learned I need to branch out a bit and ask for help from other professional friends. I guess we’ll see how it goes, gotta look after myself as well! I’ve had some busy times earning-back my money post-holiday, and I’ve started to get back into the swing of working on the project again with my functional computer! I mostly spend my project time working down a to-do list to get the engine to a functional level asap before I start thinking about building the world itself. I have also completed some of the character profiles. The engine has a bit more to go; it needs to be done by the end of the month, and I’d also like to get the remainder of the characters and key locations drawn-up properly. 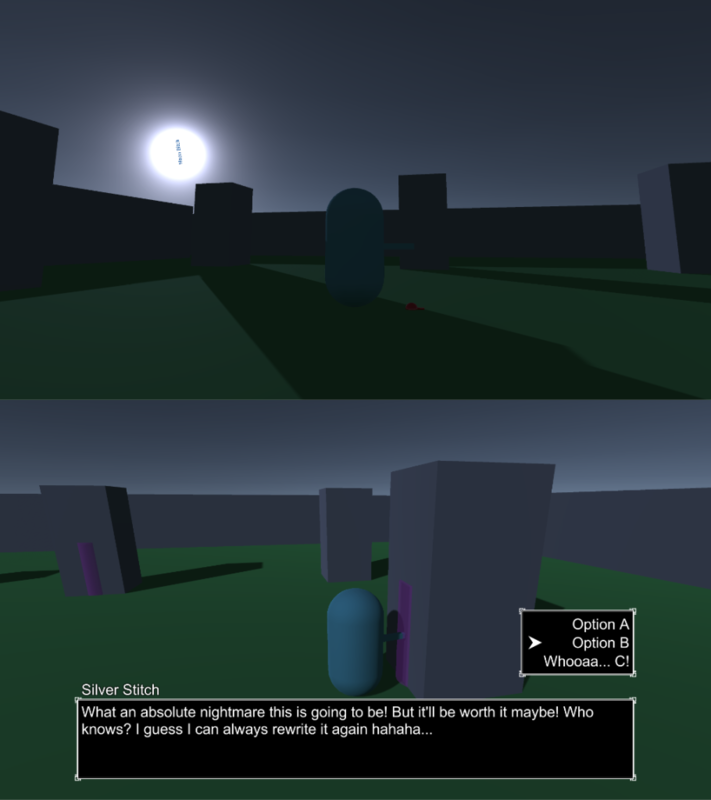 For now, have a screenshot of my lovely little night-cycle, and my functional dialogue system! Till next time, all the best~! On the game-progress side, I’ve gotten everything re-installed and working again! I’ve just started working on the engine again, as well as some other things. Hopefully next time when I’m deeper back into my work I’ll be able to show-off some progress! That’s all from me for now, I’ll be returning to the regularly scheduled broadcasting this month! Till next time, all the best~! So in the lead-up to my little holiday, I may have become absolutely consumed by work…. In this, I missed the normal ‘dev-diary’ time and when I noticed I decided to just update when I could because of how stressed I was. Then I ended up just getting more and more stressed as time went on so I decided to just do a big ol’ post at the end of the month before I go away! So here it is; the big ol’ post! Aside from the extra hours of ‘money’ work I picked up to pay for this trip, and the time spent actually planning of the trip, I committed a large amount of efforts to my project. As I will be away for number of weeks, I wanted to have as much as I could completed. Naturally, there were problems along the way, however I think I am only approximately a week behind schedule, which is really good! Unfortunately, one of those problems is my computer is kind-of failing… An issue I won’t be able to address until I get back. Even though I am yet to narrow down the cause of the cause, I know it will take me a few days of work and backing-up, and possibly a couple of hundred dollars worth of parts, to fix. This is a problem for future Matthew. I was hoping to include a photo of how the engine has come along. It now has a lovely little day-night cycle, I’ve created a sequencing system (which allows multiple events to be played in timed and specific order), and a dialogue system! There is still a bit more to go, but if all goes to plan (haha…) I should have it finished up by the end of June! Well, that’s it for me now. I’ll be heading off very soon on break so you won’t hear back from me till about June, been wracking my head around this project and work and I need a bit of a break. Not too much new or cool stuff to report for this couple of weeks. Working hard at money-job to make money. My flu from before came back with a vengeance, and a throat infection. Been updating some behind-the-scene doo-dads. Been tightening pre-production, including fine-tuning the mechanics before implementation and some visual stuff. Been working on the engine slowly, though no major progress. Like I said the flu was pretty rough so that slowed me down a lot, and because a lot of the time it’s just me encouraging myself to work a simple thing like a cold can really hold me back. Sorry I’m a day late, I’ve had a random flu hit me pretty hard this week so I was a bit off with my dates and times. This past couple of weeks have been busy, partly with boring-making-money work, partly with super-fun-time developer work. On the fun side, I’ve fixed up bit more pre-production (I told you it never stops…), and I’ve started work on the game engine proper; I’ll include a little screenshot of my early but proud progress at the end. Hopefully I’ll have a working draft with all the key features by the end of the month, and I can start working on design. Until next time, all the best~!